Our new offerings this time are all berries. Cherokee Blackberry produces medium to large berries on upright canes. It is very disease resistant and has the great advantage of requiring little rainfall to produce good crops, a bonus in these increasingly dry times. 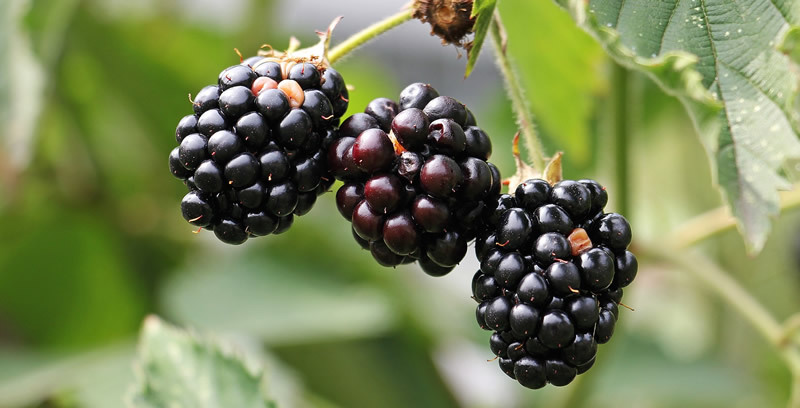 Rosborough Blackberry also can withstand some dryness and produces berries with very low acidity on erect canes. Loch Ness Blackberry produces heavy crops of large, very flavorful berries and is very winter hardy. Caroline Raspberry is a fall bearing red variety with exceptional flavor, yields and disease resistance. It is widely adaptable to many parts of the country and is well suited for both commercial and home gardens. Vintage Raspberry is everbearing and has extra large red berries with a higher sugar content, resulting in outstanding flavor. Interspecific hybrids remain very popular. These are complex hybrids of plums, apricots, cherries, peaches and nectarines. Pluots are about seventy-five percent plum and twenty-five percent apricot, while Apriums are just the opposite with more apricot than plum. Pluerries are crosses of sweet cherries and plums. Nectaplum and Peach x Plum are self-explanatory. These crosses result in some astonishingly excellent fruit with incredible sweetness and unique, complex flavors that are unlike anything else. It is no wonder, then, that almost every variety is a taste test winner at Dave Wilson fruit tastings. In addition to every one of the Pluots, some notable winners include Cot-N-Candy and Flavor Delight Apriums and Sweet Treat and Candy Heart Pluerries. Since most of the interspecifics are fairly low chill and quite a few are hardy to zone 6, they are suitable for many different climates. Consider trying a variety or two in your own orchard, making sure that you note pollenizer requirements. Fruit joy awaits! Keeping the fresh fruit season going for months without ending up with too much fruit all at once is a most worthy goal and very possible. Cherries start ripening in May, as does Desert Dawn nectarine, Royal Rosa apricot, Earlitreat, Flordaprince and May Pride peaches. Summer ripening choices are practically endless with some fruit not ready until September, October and even later. Jujubes, walnuts, pecans, pomegranates, quince, persimmons, many apples varieties, some almonds, Shinko Asian pear, Fairtime peach, Emerald Beaut and Elephant Heart plums, Bosc, Comice and Kieffer pears and Flavor Grenade and Flavor Finale Pluots are all late ripening, potentially giving you six months of fresh fruit from your own orchard! Above is part of the Fruit and Nut Harvest Dates Chart from Dave Wilson Nursery. You can download the complete chart as a pdf here. Those of you who have been ordering from us for a long time will no doubt notice that our catalog is missing quite a few standard items. This is because our dear friends at L. E. Cooke decided to stop doing the bare root side of their business which has left us with no supplier for some things at this time, despite our best efforts at sourcing them elsewhere. We are very sad indeed at the loss of L. E. Cooke, not just for ourselves and our customers, but also for all the people there that we got to know over the years. We wish them all well and hope the best for them in their future endeavors. We also hope that we will be able to find sources for some of the items now missing and once again make them available to you, our valued customers. 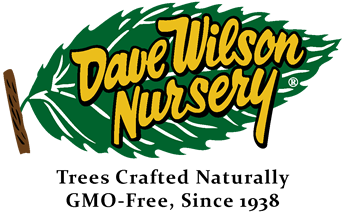 Thankfully, the fine folks at Dave Wilson Nursery stepped right up and started growing some of the really popular Cooke varieties, ensuring that they will not be lost to us. Many thanks to everyone at Dave Wilson for saving the day!